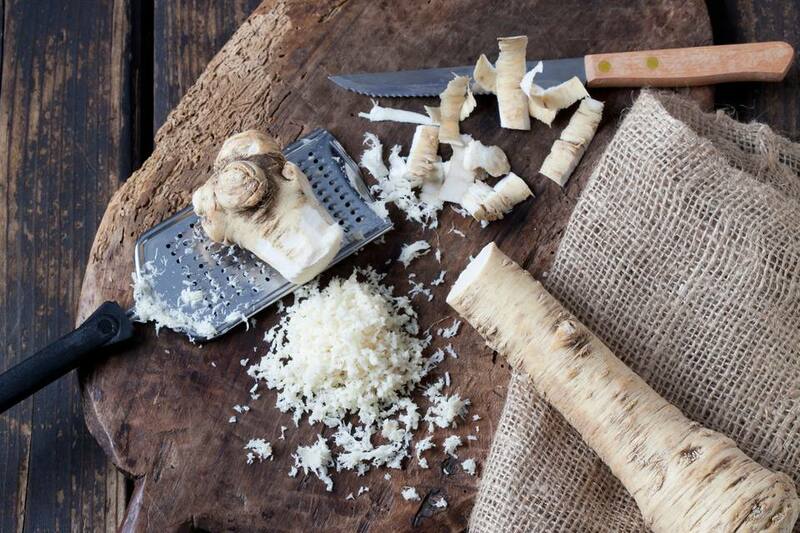 Fresh horseradish root is available year-round in most markets, but prime season is in spring. The roots are usually sold in 2-inch long sections (although the whole root can range up to 20 inches), measuring 1 to 2 inches in diameter. Choose roots that are firm and have no mold, soft or green spots. Older roots will look shriveled and dry. They may even begin to sprout. These are to be avoided. Bottled prepared horseradish is readily available in the refrigerated condiment section of grocery stores. Prepared horseradish is preserved in vinegar and salt. The red variety uses beet juice. Dried horseradish is also available in many markets. It must be reconstituted with water or other liquid before using, like Japanese wasabi powder (no relation). Store horseradish root unwashed in a plastic bag in the vegetable drawer of the refrigerator. It begins to dry up as soon as it is cut, so if you have purchased it at the market, try to use it within a week or two for fullest flavor. Once it is cut or grated, used within a few days unless you preserve it in vinegar. Prepared horseradish will last up to 3 months in the refrigerator. However, it quickly loses pungency and is best used within 3 to 4 weeks. When it begins to turn dark, it is time to toss it. Freezing of prepared horseradish is not recommended. Freezing is not recommended for whole pieces. However, grated fresh horseradish may be frozen up to 6 months. You may wish to flash-freeze it by the tablespoon in ice trays or on waxed paper, and then place in a sealed plastic bag in the freezer. Keep in mind that it will lose pungency when frozen.